Betta fish can live in smaller bodies of water than other aquarium fish tolerate, but even so, they need good care to maintain their health and avoid developing conditions common to ailing fish, such as popeye. 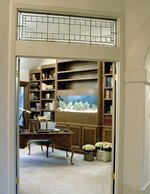 Frequent water changes help prevent popeye from occurring; an existing case of popeye is treated by adding certain medications to aquarium water. Bettas living in good conditions rarely suffer from diseases. Popeye -- also called exophthalmia -- causes pressure behind the eyeballs, making a fish's eyes protrude. It's easier to prevent than to treat. Over time, eyes suffering from popeye can turn milky white and become damaged. In severe cases, the eye or eyes can decay and fall out. Dirty water, serious illness, accidents, mishandling and fighting can cause popeye in bettas. If both eyes are affected, the cause is probably internal; but if only one eye is protruding, the cause is likely injury. Losing one eye normally doesn't affect a fish severely, though he may need to be fed with forceps if he struggles to locate food. Popeye isn't usually fatal by itself. Maintaining clean water helps prevent popeye in betta fish. 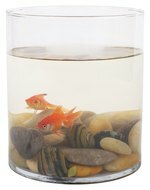 Bettas can survive in small containers of water because they can take in air at the water's surface, but they need frequent water changes to maintain good water quality. Change 100 percent of the water every day or every other day in tanks smaller than 1 gallon, and change 25 percent of the water every week in larger tanks. To complete a 100 percent water change, guide the betta into a small container of his current aquarium water, and scoop or siphon out all the remaining water in the tank. Refill the tank with fresh water, then replace the betta. Always refill your betta's tank with water that has been treated to remove chlorine and other chemicals, and that has been warmed to the right temperature. Vacuum or siphon the gravel at every water change. An steady temperature within the aquarium reduces the risk your betta will develop popeye. Bettas need warm, stable temperatures between 72 and 82 degrees Fahrenheit. Rapid temperature changes weaken their immune systems. Don't allow a betta tank's temperature to drop below 70 degrees Fahrenheit or to change more than three to five degrees within 24 hours. Tanks larger than 5 gallons should be fitted with aquarium heaters. The risk of popeye caused by injury is reduced in a safe environment. Don't use coarse fishnets to handle a betta, and use a net to guide the fish into a plastic container to remove him from the tank. Turn on room lights before turning on aquarium lights to avoid startling a betta, and don't keep a male betta with other male or female betta, to avoid fighting. At the first sign of popeye, immediately conduct a complete water change. Adding Epsom salts or the antibiotic ampicillin to the fresh tank water are effective treatments. Consult a vet for dosage and follow his directions precisely. Separate out antibiotic powder from capsules before adding it to the water. Sprinkle the salts or antibiotic on the water surface, and stir gently with a plastic spoon to dissolve the powders before returning the betta to his home. Your vet might suggest that you add Epsom salts or ampicillin to the tank water during daily water changes for one week. Epsom salts reduce the swelling in popeye, but it may take weeks or months for the eyes to return to normal. Providing good care for betta fish suffering from popeye helps prevent the condition from returning. Add plastic or live aquarium plants to your betta's tank to reduce stress, and feed carefully. Overfeeding and poor diet contribute to ill health in bettas. Feed a young betta twice a day or an adult once a day. Give as much food as the fish can eat in two to five minutes. Vary the diet: Aquarium stores sell specialized betta food, and you should supplement this with freeze-dried brine shrimp and bloodworm. Frozen and live small crustaceans, worms and insect larvae also provide variety in a betta's diet. One day per week, don't feed your betta, to allow his digestive system to clean itself out.